There are two different statuses Drift can have on your account: your Agent Status and the Widget Status. Though both can be Online or Offline, these affect different areas of Drift. These two settings control different things: Agent Status affects your teammates being routed to conversations. While Widget Status affects the Drift Widget's online/offline messages. Think of it like a store. The Widget Status is the store’s hours. When it’s open (or online), it invites customers in and lets them know someone is available to help them. When it’s closed (or offline), it says someone isn’t here to help you right now – but feel free to leave a message! You can flip the open and closed sign manually or you can have it follow regular business hours. Your Agent Status is your personal availability in this this store. If you’re are Available, you are working greeting every customer that comes in. When you are Away, you are in the back room and not interacting with clients. This it is important to consider both your Widget status and your agent status when working with customers. If your Widget is Online and creating the expectation of availability, it is not helpful to your customers if no one is online. Awesome! So how do I set this up? Widget Status is helpful for displaying the Widget itself, and determining which version of your Default Greeting, Welcome Message Playbook, and other playbooks with targeting will be shown. Here is an example of the Online vs. Offline Welcome Message Playbook. First go to your Drift Widget Settings, and choose Hours & Targeting. Setting your Widget to "Manual" will leave the responsibility of turning Drift Online/Offline at the beginning/end of the day, on you. If your Widget is offline, your customers will see a notice (see below) that you are offline! Your widget’s mode will not affect the status of your agents and vice versa, unless you have the following toggled on. In that case, when all users are away, Drift will go offline. Sometimes, you have to run to a meeting. Or you're out of the office for a bit. 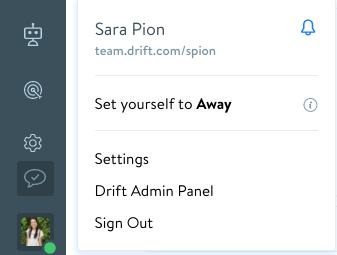 That's why we built the option for you to easily switch Drift offline in the navigation bar! At anytime, click on the little ✓ icon above of your picture and flip the switch to turn Drift offline. This will stay in effect until you switch it back on. You Agent Status is your personal availability. The purpose of this status is to handle how to notify and assign agents to conversations. Your status can be Available or Away. From any page in Drift, you can now click on your avatar in the bottom left corner of the page to set your status. You will get the normal notifications that you have turned on in your notification settings. New conversations will be assigned to you. You won’t be added to any conversations when you’re “Away”. Pro Tip: At Drift, our support team works in shifts. When one person starts their shift, they turn their status to Available, and the agent whose shift is over turns their status to Away, adjusting routing accordingly. No matter what your individual status is, the status of the Widget will not be changed. 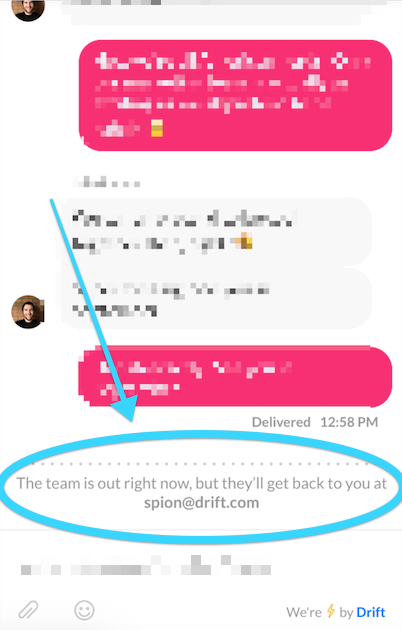 Unless all Drift Users are away and you have the Go Offline when all Users in Drift are away turned. Then Drift will automatically go offline, even if it is during business hours. As always, if you have any questions let us know!